From absolute beginner to more experienced maker. Maximum of six students per group. 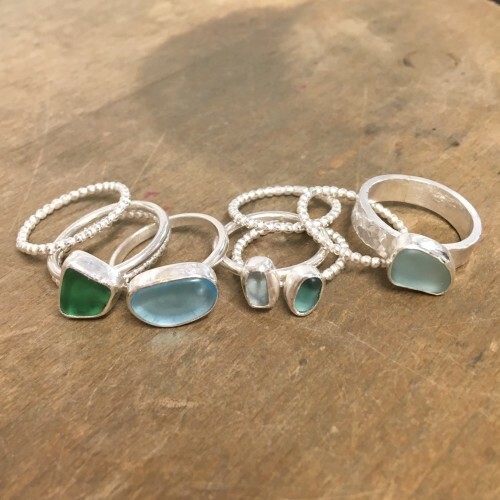 Classes can cover all basic bench skills, casting, enamelling, etching, working with anodised aluminium, beginners stone setting, press forming and more. 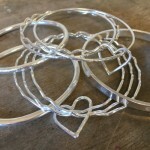 If you are new to working with silver we will start with the basics – soldering, piercing out, riveting etc. Classes are designed to move at a pace that suits you, and as you gain confidence more skills are introduced. The small class size means lots of one-to-one tuition from experienced, qualified teachers, and a friendly and (hopefully!) fun atmosphere to learn in. Start date either Thurs 25th April or Thurs 2nd May. 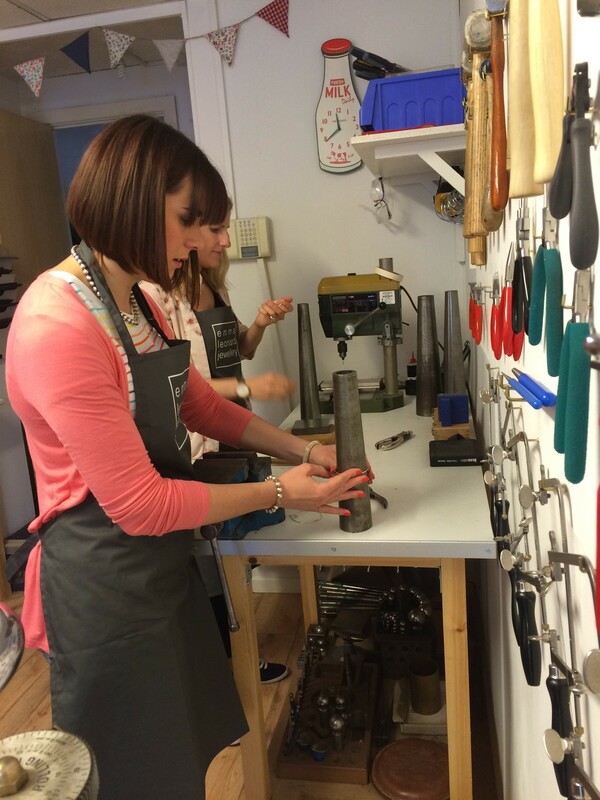 A workshop voucher makes a great gift, or a chance to try out a new skill for yourself. 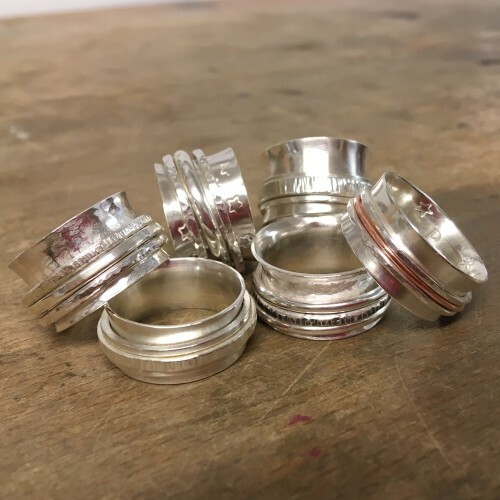 The one day beginners workshops are suitable for someone with no previous experience, and make a great introduction to silversmithing – with a fantastic finished piece to wear home! Please note if you are booking using a gift voucher you will need to contact me directly rather than book online. In this lovely one day workshop you will learn how to handle texture and cut the clay. 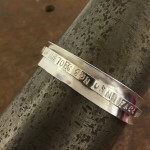 How to size and form a seamless ring band from silver clay. How to make tiny embellishments from silver clay, both by hand and using moulds. 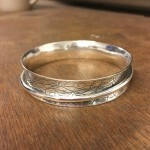 How to add decorative components to your ring band. 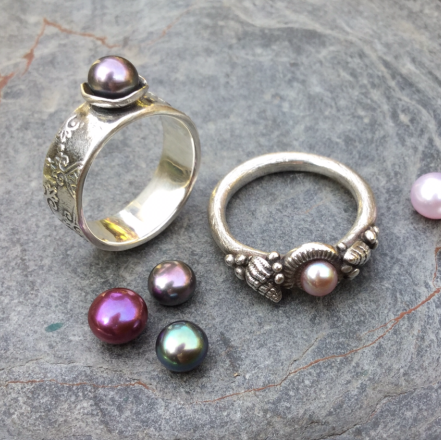 How to fire, polish and patinate your ring before setting a beautiful fresh water pearl. A material fee of approx £20-£25 is payable to Grainne on the day of the workshop. There will be a selection of fresh water pearls to choose from. 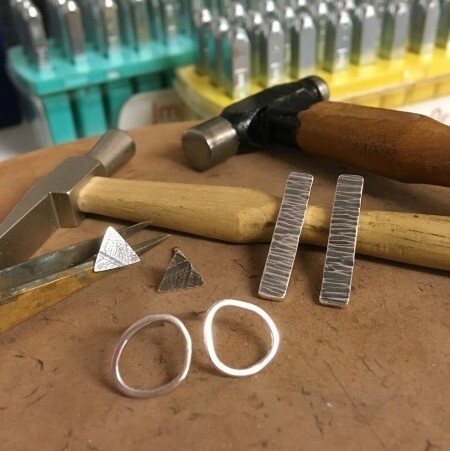 This workshop is suitable for beginners and for those with some experience of using silver clay who would like to further develop their skills and knowledge. *NEW* Make a Spinner Bangle – great for intermediate makers. Advance your skills and learn to make a beautiful spinner bangle. 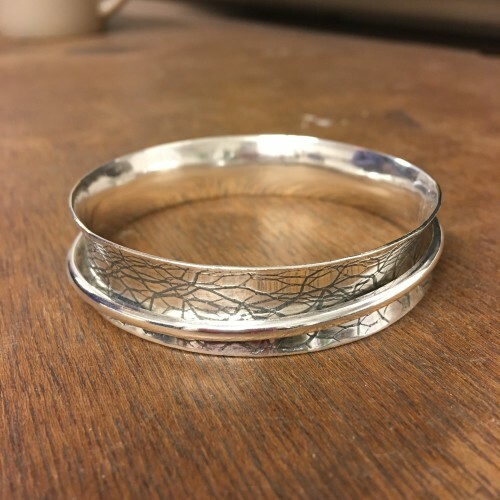 This class looks at larger scale soldering techniques and uses a dedicated spinner former to create a double layer bangle. 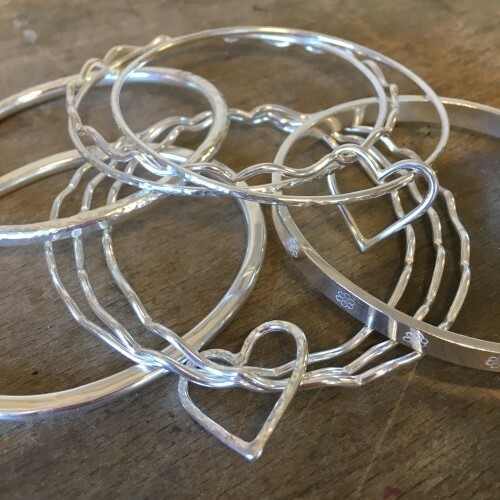 With the facility to try roll printing, texturing or stamping on both the inner or outer bangles, and a range of bangle press formers to use there are infinite combinations of finishes to personalise your design. We will also look at traditional anti-clastic raising as part of the making of the bangles. This workshop would suit a maker with some experience of silversmithing (you will need to have experience of soldering, using files and basic finishing to get the most from the day). Materials are charged by weight on the day – the costs will vary depending on the style of bangle you choose to make, but as a very rough guide allow approx £30. Do contact me if you would like to discuss materials requirements or to bring your own silver to work with. Grainne will be back in the studio with another of her great workshops, this time a wonderful opportunity to design and make your own beautiful solid silver pendant or earrings incorporating accents of 24ct gold. How to make embellishments to add to your design. How to add accents of 24ct gold to your design using the ancient Korean method of applying gold … Keum boo. 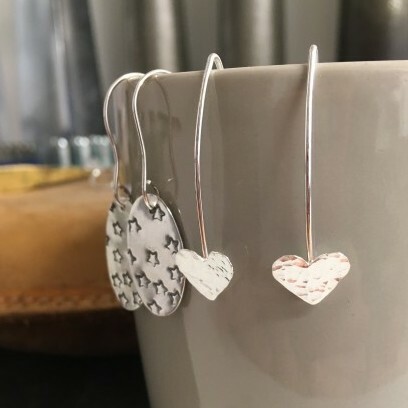 This is a fun and informal workshop which is suitable for beginners and for those with some experience of using silver clay who would like to further develop their skills and knowledge. 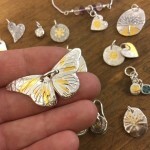 The £30 material cost covers a 10g pack of silver clay, which is sufficient to make a small pendant and a pair of earrings or 3-4 small charms, and also the 24ct gold for embellishment. 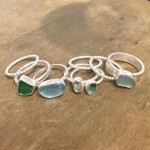 Additional silver clay, lab created gemstones, sterling silver chains and earring fittings will all be available to buy from Grainne on the day. Make a Spinner Ring – great for beginners. 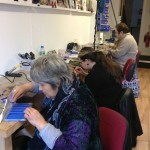 One day workshop 10am-5pm £65 plus materials. 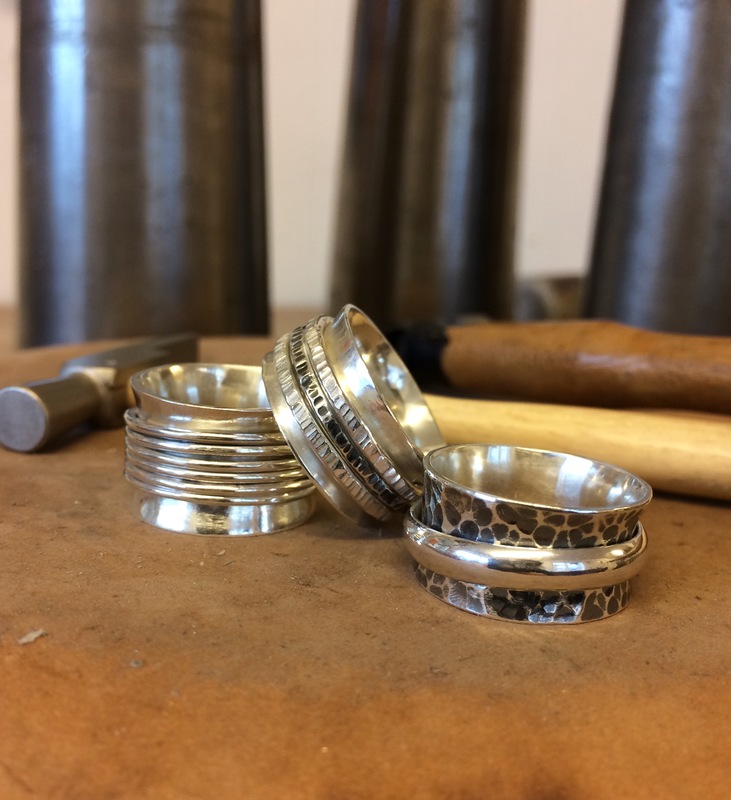 Make a fantastic spinner ring in a day – ideal for complete beginners. In this super-popular class you will learn how to form a ring, solder, texture and polish, use chemical patina, and go home wearing your creation. With lots of options for different combinations of textures, spinning bands and finishes each one is unique – the only difficulty is making a decision what combination to make! Materials costs vary on the day depending on the size and style of ring made, but as a rough guide allow approx £10. 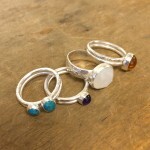 Make a cabochon stone set ring – great for beginners. Materials are extra due to the differing costs of stones etc. 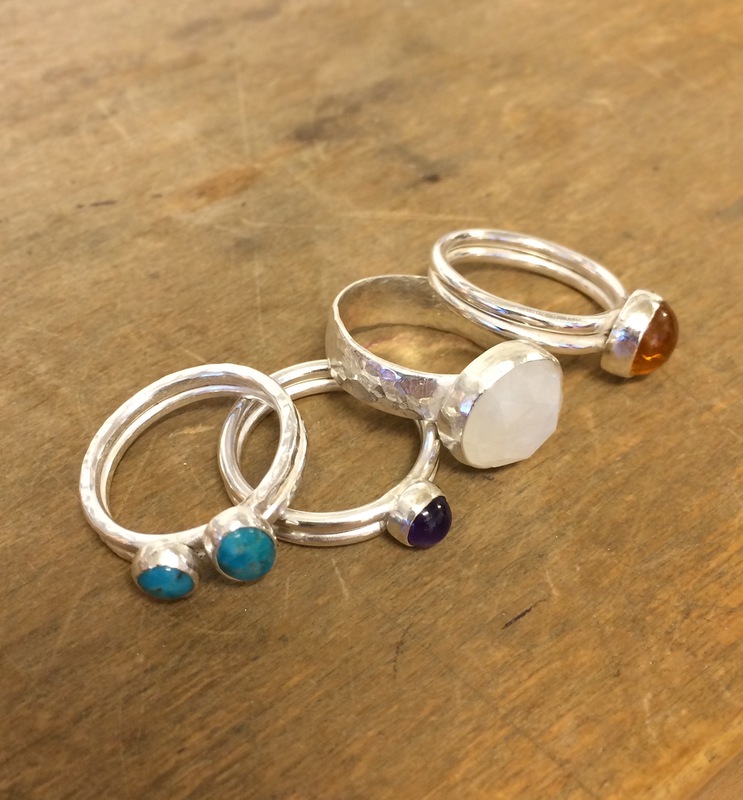 Both silver and a selection of stones are available to buy at the studio (as a rough estimation allow £10-£15 extra for materials). You are welcome to bring your own stone if you have one – we will be working with round or oval stones, just contact me if you have any questions. *NEW* Make your own earrings – great for beginners! A great workshop for absolute beginners. 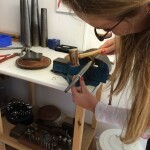 You will be introduced to a variety of basic skills including using a piercing saw, soldering and finishing and polishing. 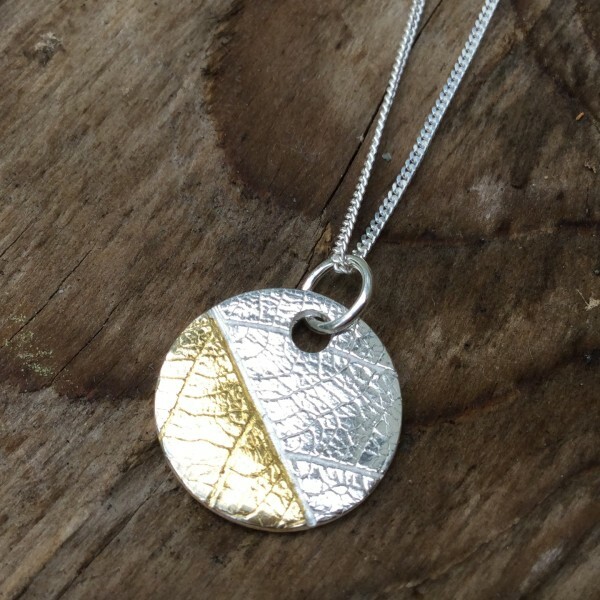 The rolling mill can be used to ‘print’ a pattern or texture onto the silver and various shapes can be cut and decoration added to make a beautiful simple pendant. You can also experiment with using hammers and punches to add texture and patterns, and the use of chemical patina. Statement studs, hoops or dainty drops, whichever you prefer! This is a really creative day with lots of experimenting – you can work at your own pace and make as many pairs as you would like. The silver you use is weighed at the end of the day, but as a very rough guide allow approx £5-£10 for materials. 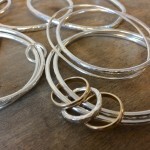 Make a bangle – great for beginners! 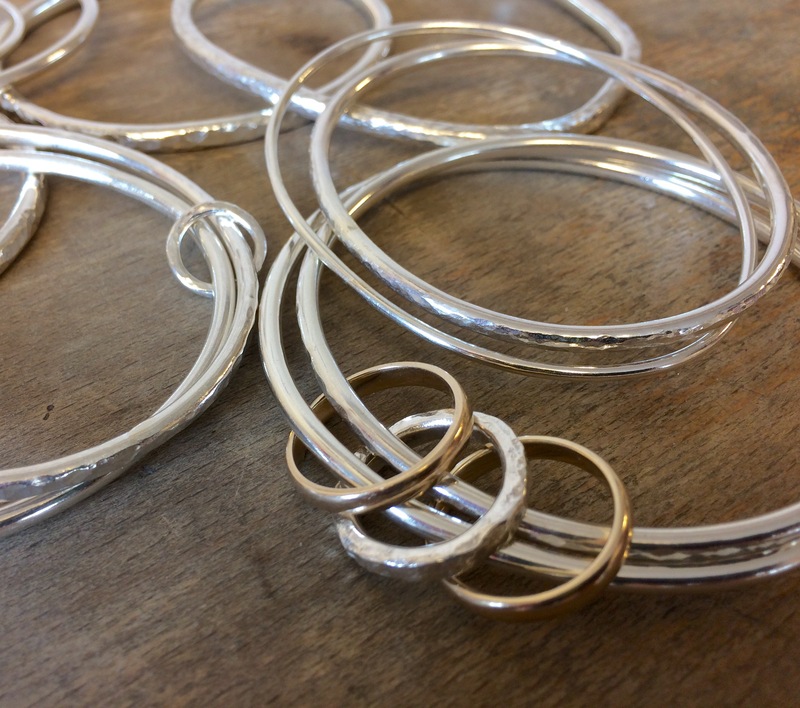 Materials costs vary depending on number and size of bangles being made, but as a rough guide allow approx £20 for a single chunky bangle. 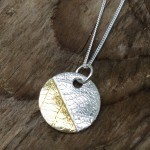 Make your own patterned pendant – great for beginners. A great workshop for absolute beginners. 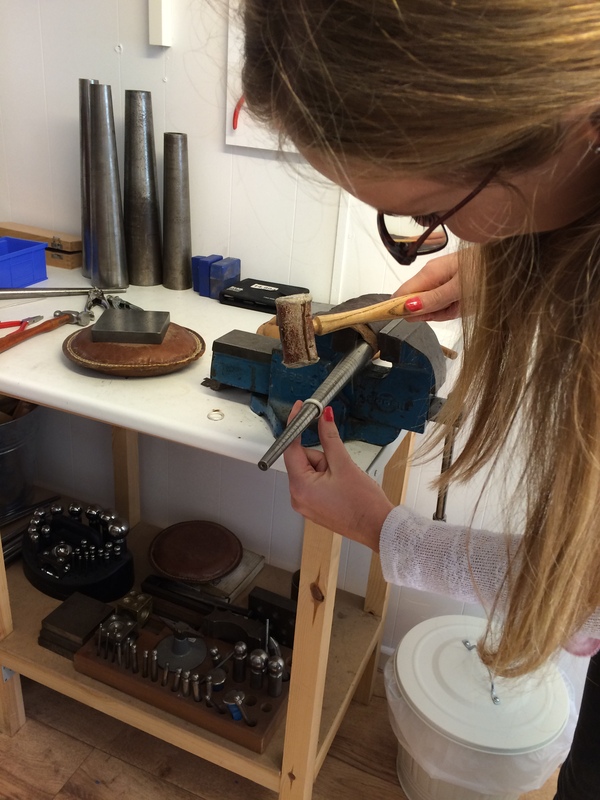 You will be introduced to some basic skills including using a piercing saw, soldering and finishing and polishing. 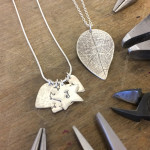 The rolling mill can be used to ‘print’ a pattern or texture onto the silver and various shapes can be cut and decoration added to make a beautiful simple pendant. You can also experiment with using hammers and punches to add texture or personalise with text, and the use of chemical patina. The price includes enough silver to make a pendant size 3x3cm and a choice of chain. A great way to try out a new skill, or a lovely gift. Dates to be confirmed – Please contact me for more info. Experiment with texture, pattern and print in your jewellery designs. Learn how to apply resists and etch metal to create detailed designs. The day includes time to experiment with free hand, paint on resists and also photo etching using PnP paper which allows you to work with any black and white image (patterns, drawings, photos etc). 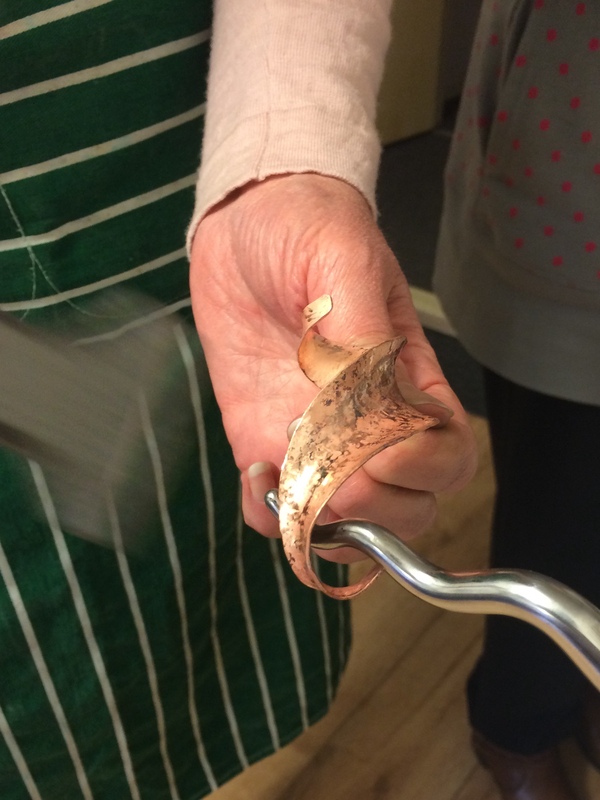 Fees include copper to experiment on – if you would like to work in silver this can be purchased at cost price on the day at the studio. This class would suit a beginner who wants to try something new (etched pieces can be turned into a simple pendant for example) or someone with some silversmithing experience who wants to use a new skill in their work. Date to be confirmed – Please contact me for more info. 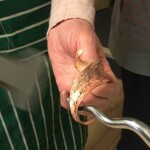 A one day workshop covering different types of casting. Learn about different casting processes, try out delft clay casting, and learn how to carve waxes ready to send away for lost wax casting. 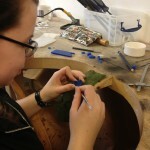 A great way to expand your making skills and develop your jewellery designs. Lost wax casting offers an opportunity to reproduce forms and produce small batches of work. 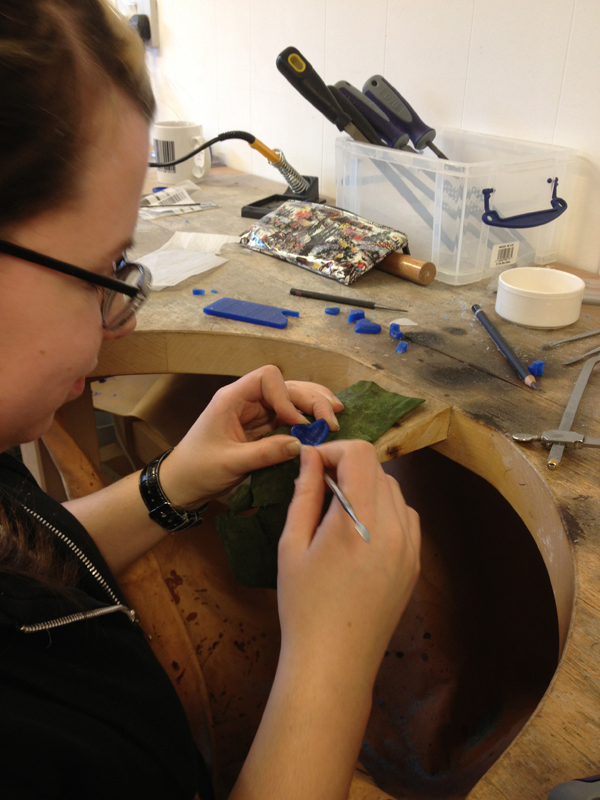 All tools and wax are provided, and silver is available to purchase at the studio if you wish to use your delft casts. 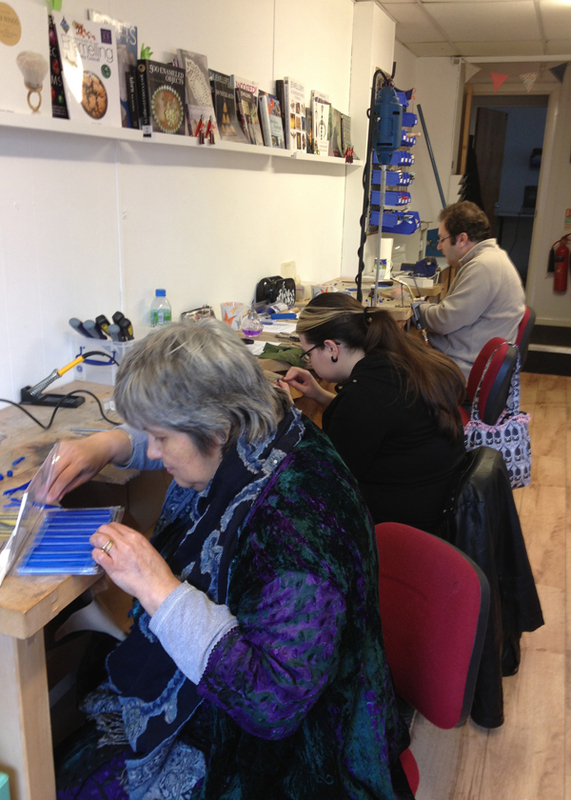 This class is better suited to someone who has some silversmithing experience and would like to develop a new skill. Gift vouchers are available and can be customised for any occasion – contact me for more details.